These ceramic beads are hand made in the European Union. The glazing on each batch varies slightly, so the coloring you receive may be slightly different than what is pictured. 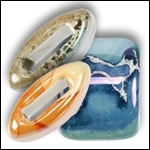 This makes each bead unique, and provides a unique and colorful focal point to your design. 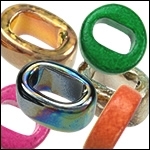 They can be used with any metal spacers, beads and o-rings to create an elaborate look. They are fragile so please handle with care. Some cuts of leather that are slightly thicker will not work with these beads. If the bead is not fitting, please try it on a different piece of leather. Do not force them onto the leather as they will break.